This time of year (especially with the mini heatwave we had yesterday) it’s tricky to decide which season we’re currently enjoying! 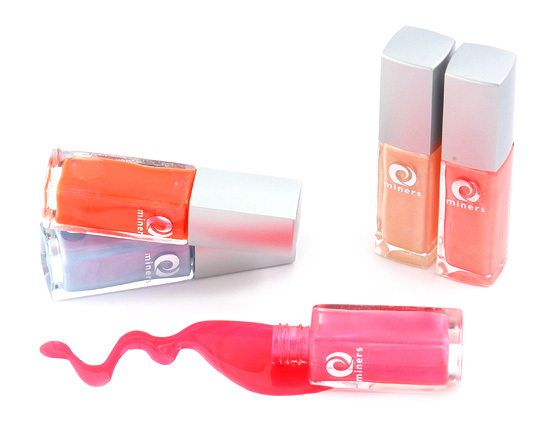 With that in mind, check out Miners Spring/Summer nail collection which comprises a bit of both! Rio Pink: Not to look out of place on a Brazilian beauty dancing her way down the main strip of Rio Carnival, this shade is perfect for the beach. With a pearlescent finish and bright pink tone Rio Pink is fun, flirty and fashionable – the perfect colour for a beached beauty, along with those who like to dream. Jaffa: Inspired by bright African colours and prints, Jaffa is a muted orange shade with a pink pearlescent undertone giving an electric look without being over the top. Jaffa is perfect for a sunny adventurous look either adding a bit of sunshine to ware away the April showers or to enhance your beach bronzed tan. Apricot Blush: Seen on the catwalks from London to New York this is a milky-pink shade with a silver pearlescent base. Apricot Blush is perfect to add a bit of sparkle and make this seasons 70s romance style rock! Flamingo: Putting the fun back into girly, Flamingo is a gorgeous rosy shade of pink, with a slightly orange undertone – perfect to add a touch of glamour to an everyday feminine look. Denim Shorts: Following the catwalk trendsetters Jeremy Scott and Giles we have added a blue hue to our nail collection. Denim Shorts is a washed out blue with light pink undertones, a perfect shade for the beach or to brighten up a natural, plain look. I’m loving the look of all of these with the exception of Jaffa (which is ontop of the blue). I have a Miners glitter polish that I love, so will have to see if I can hunt these down as stockists seem to be pretty thin on the ground. Now these I DO like. I’m so sick of cremes. Phew! Something slightly different. They are kinda difficult to work with but I love the Baby Blue and the Bronzey Coral (Flamingo). The hot pink it pretty nice too! Oh btw, you haveta check out their bronzers, AHMAZING!